Entries for the 2017 'The Circulars' Awards are now open - are you or your business eligible? The industrial age saw the rise and predominance of the 'linear' growth model of ‘Take, Make, and Waste’. Whilst delivering considerable prosperity to many societies, this model now belongs to a past era, as does the ‘throw away’ culture borne from it. By 2050, humans are on track to be consuming three planets worth of resources every year. This model clearly cannot be sustained! The circular economy is a resource-efficient alternative to this traditional, wasteful, linear economy. It decouples growth from scarce resource use, allowing economic development within natural resource limits and drives companies to innovate and consumers to do ‘more with less’, whilst creating business value. This business value, above and beyond the sustainability imperative, is significant. The circular economy is expected to be worth $4.5 trillion within 15 years, as reported in Accenture’s Waste to Wealth – The Circular Economy Advantage available here. This value is achieved through eliminating waste, in all its forms, and utilising natural resources, assets and products to their full extent. Value is further gained through reducing the business risk of increasingly volatile resource prices in an increasingly resource-scarce world. Circular economy pioneers are already extracting the significant value on the table. One such innovative company is Caterpillar. Caterpillar’s increasing focus on extending its product lifecycles and re-use has resulted in business and shareholder value. Their remanufacturing business reclaimed 70 million kg of end-of-life material from customers in 2015, and remanufactured it into same-as-when-new condition! The result? Products, services and solutions associated with sustainability and circular economy initiatives accounted for 18 per cent of the company’s total sales and revenues in 2015. Another leading company is LanzaTech, founded in 2005 in New Zealand, which captures utilizes carbon , municipal waste and other sources to create fuel and chemical products through a gas fermentation process. This is a classic example of extracting value from previously untapped waste streams. Van Hulley, a Dutch company, recycles old shirts into boxers and shorts. Again, a great example of extracting value from previously unwanted or underutilized assets – in this case, old shirts. This is also a great example of upcycling, which is a hallmark of a true circular economy system. Still, more work remains to be done and greater uptake across all industries is required to truly drive necessary change required. Companies need to quickly emulate the likes of Caterpillar, Lanzatech and Van Hulley, who are embracing circular practices, breaking new ground and deriving significant business value as a result. These and other innovative companies were recognised for their circular economy work at The Circulars Awards 2016. The Circulars is an initiative of the World Economic Forum and the Forum of Young Global Leaders, run in collaboration with Accenture Strategy and in its third year. 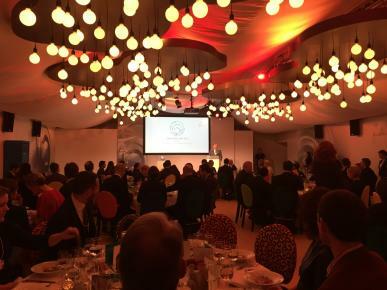 The awards recognize individuals and organisations from commerce and society making a notable contribution and fostering the adoption of circular economy principles. Entries for the 2017 Circulars Awards are now open. Winners and Runners Up will be invited to an awards ceremony at the World Economic Forum Annual Meeting in January 2017, to showcase their circular economy innovation and be rewarded for their achievements in driving business and society towards a circular future. Companies and individuals can apply here, no later than September 30th. There's also a People’s Choice Award for Entrepreneurial organisations, in which the winner is chosen by way of public vote; to be considered, companies must submit their entry by September 15, 2016, for judging to take place in the fall.